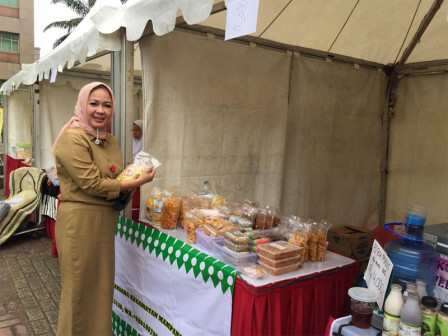 Tens South Jakarta KUKMP's fostered traders participated in bazaar held at South Jakarta Mayor Office, Monday (11/19). These fostered traders have been trained about business management and product quality enhancement before.
" KUKMP Sub-dept. provides 15 tents for these 32 traders"
KUKMP Sub-dept. Head, Shita Dhamayanti stated, participants in this bazaar have joined Integrated Entrepreneurship Development (PKT) and marketing stage. "KUKMP Sub-dept. provides 15 tents for these 32 traders who have entered marketing stage," she informed, Monday (11/19). One of traders in this bazaar, Isra (42), claimed to be lucky for joining PKT program because not only trained about management and product quality enhancement, he is often involved in bazaars held by KUKMP Sub-dept. and South Jakarta government. "I get better income after joining this training. Now, I employ five people," he conveyed.